Maharashtra has one of the highest electricity tariffs in India for residential consumers. It is a well-known fact that urban city consumer, along with the industries and commercial establishments, contribute to the state government subsidy of electricity for farmers. With little respite from the populist measures of subsidizing electricity costs for the rural consumers, high transmission and distribution losses and an ever-increasing cost of electricity from sources like coal and gas, we will continue to have our electricity tariffs going up by 4~5% every year for several years to come. This means that the approximate Rs 7/unit tariff will go up to more than Rs 30/unit in the next 25 years. That definitely does not bode very well. The only way to tackle this problem of rising electricity tariffs is by producing your own power. The only viable solution is to Go solar and that too in a highly economical and reliable manner. This is where your vacant rooftop comes to your rescue. MYSUN is providing the installation of solar panels in Pune. If you have an unused rooftop, today, every homeowner can save lacs of rupees by installing a rooftop solar power system. And in the process, also make a huge contribution to the environment and to their children’s future. Would it not be awesome to take a decision today and make a difference for the next 25 years? Look at the illustration below, derived from the MYSUN Solar Calculator. The installation of a rooftop solar system in Pune has helped a lot of people save money. Mr Pant lives in Wakad in Pune and pays Rs 8000 per month electricity bill. By installing a solar system of 6kW, his monthly electricity bill reduces by approx 98% to Rs 165 per month, which is the fixed meter cost. 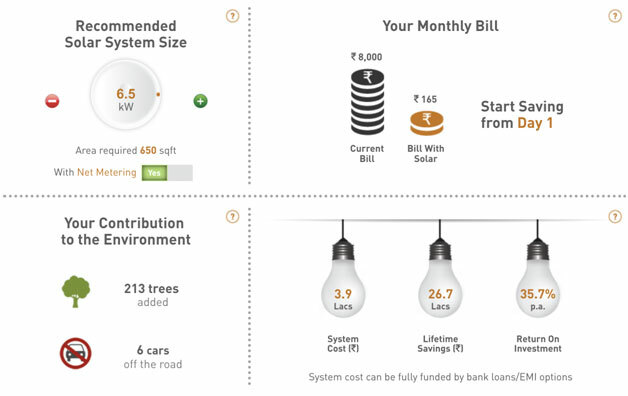 And with a solar system life of 25 years, he ends up saving Rs 26.7 Lakh overall with 35.7% Return on Investment. As you can see from the illustration above that there is a lot of merit in going solar. Pune is a city that receives an abundance of sunlight and the Solar Policy of Maharashtra is one that encourages all residents to make the move to the sunny side. Therefore, there is definitely no better time to Go Solar than now. In the case above, Net Metering has been switched on since the state allows it. In case you are wondering what is Net Metering, it is a process where all the extra units that you generate from your solar system that go unused, are sent back to the main grid and adjusted monthly against your consumption from the grid. Going solar will not just be a great financial investment because the biggest benefit of all is that you will be making a difference and a positive environmental impact by moving to greener and cleaner source of energy. MYSUN can help you become an adopter of Solar Energy in Pune.